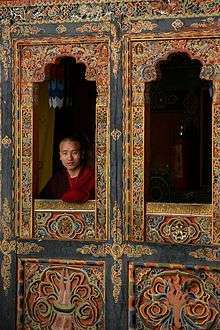 Buddhism is the major religion in Bhutan. Vajrayana Buddhism is the state religion of Bhutan, and Buddhists comprise two-thirds to three-quarters of its population. Although the Buddhism practiced in Bhutan originated in Tibetan Buddhism, it differs significantly in its rituals, liturgy, and monastic organization. The state religion has long been supported financially by the government through annual subsidies to Buddhist monastery, shrines, monks, and nuns. In the modern era, support of the state religion during the reign of Jigme Dorji Wangchuck includes the manufacture of 10,000 gilded bronze images of the Buddha, publication of elegant calligraphied editions of the 108-volume Kangyur (Collection of the Words of the Buddha) and the 225-volume Tengyur (Collection of Commentaries), and the construction of numerous chorten (stupas) throughout the country. Guaranteed representation in the National Assembly and the Royal Advisory Council, Buddhists constitute the majority of society and are assured an influential voice in public policy. 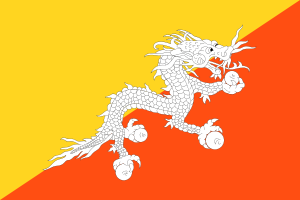 ↑ "International Religious Freedom Report 2007 - Bhutan". U.S. Department of State. 2007-09-14. Retrieved 2008-01-06. ↑ Baruah, Bibhuti. Buddhist Sects and Sectarianism. p. 235.